A utility knife is the undisputable staple of any serious DIYer’s toolbox. It comes in handy to facilitate the quick and effective completion of a wide array of tasks around the house, in the office and construction site, and even in the great outdoors. While they rival the cutting power and prowess of the kitchen knife, they’re built for more aggressive cutting, which explains why every DIY enthusiast, carpenter, contractor, and the homeowner should have one. Not just any, though. The ideal utility knife is packed to the brim with instrumental features, superior ergonomics, and longevity, all of which culminate into heart-stopping performance. Finding such a tool can be a frustrating, time-consuming, and energy-draining task, which is why we’ve dutifully stepped in to do the heavy lifting for you. After tens of hours spent researching, analysing, and comparing, we’ve finally put together a carefully assorted list of 10 of the best utility knives currently on the market. Read on. 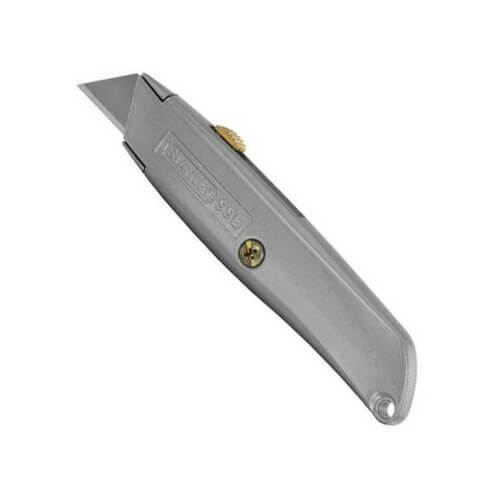 There isn’t a single thing a utility knife can do that Stanley’s flagship option, Stanley 10-099 Classic 99, can't do. Which partly explains why it's an all-time favorite of homeowners, tradesmen, and outdoor enthusiasts the world over. Its budget-friendliness, sturdy construction, and no-frills design leave it tunnel-focused on getting the job done, and in that endeavor, it has never failed since its inception 17 decades ago. If the fact that the utility knife cuts cleanly, smoothly, and quickly and is incredibly safe to use doesn’t appeal to you, maybe the fact that it comes with a sturdy handle and thick blades for seamlessly handling hard-use applications will. The first unique selling point is a long laundry list of auxiliary features is the construction quality. Even though it goes for a pittance, all the blades feature heavy-duty construction using industrial-grade carbon alloy steel for a pro-grade performance. Carbon alloy steel retains its edge for much longer than other materials and therefore enables it to stay sharp for longer, shearing through various materials and objects with remarkable ease and speed. It's, therefore, a perfect choice for cutting drywall, roofing shingles, and even paper. On top of that, the blade is 3-position retractable and features an interlocking nose for holding the blade securely and safely in place and comes with three additional 11-921 heavy-duty utility blade, all of which are covered by a generous warranty. Another feature that makes it a perfect choice for professional and home improvement tasks is the ease of use. The tool is made with the convenience of the user in mind. As well as being lightweight and compact for effortless manouvrability and control, there’s a dedicated blade storage compartment in the handle allowing for quick and easy access. The 10-099 is an all-around tool that’s ideal for a wide range of home repair and improvements projects ranging from ceiling fan installation, home framing, cutting drywall, roofing shingles to paper. At its price, it’s an unbeatable offer. If you’re looking for a high-performance option built to last more than a lifetime of hardy, extreme use, look no further than the FC knife. An epitome of quality, reliability, and value, this is a far cry from the cheap, off-brand models on the market. It comes with a slew of attributes aside from the trademark bright red color of the handle. These features include a lock-back design, lightweight aluminium body, and holster. Continue reading to know how the tool stacks up against other industry stalwarts. Like our first pick, this option can withstand lots of attrition. All the blades are crafted with first-rate carbon steel, a heavy-duty and durable material that lends these properties to it. As a result, it will retain its edge for the next several years and require minimal maintenance in the way of sharpening. In addition to light-duty projects such as ripping open boxes and cutting ropes and wallpapers for room decoration, the utility knife also leverages its hardy, fastidious construction to effortlessly and seamlessly take on tough projects like cutting cardboards and plastics. Boasting a perfect blend of performance, strength, and lightness, it gets the job done quickly and smoothly. Its no-frills design makes it outstandingly easy to use. It features an innovative one button lock-back design for locking the blade in place so you can use it safely and efficiently. You can quickly retract the blade for safe transportation and storage after a project. As well as being compatible with virtually all standard size blades, changing the blade is easy and quick, thanks to the tool-less quick blade change design. And irrespective of your hand size, the knife is guaranteed to fit firmly and securely seeing as its both compact and foldable. Plus, it weighs a paltry 4.8 ounces, meaning that it won’t weigh you down. Additional features include the anti-slip and comfortable handle grip and the rust-resistant anodized aluminium finish. It comes with a holster and 5 additional replacement blades so that you’re always ready for the next heavy-duty project. And the stainless steel clip makes it highly portable. For those looking for a near-perfect everyday carry knife for use in multiple settings, the FC knife comes highly recommended. s utility knives, we honestly don’t know how to start reviewing the workhorse that’s Gerber EAB Lite. We’ll give it a shot, though. While it has a lot in common with its competitors, it sets itself apart on the strength of its seamless blend of ergonomics and safety. Not only is the stainless steel handle comfortable but it also comes with deep finger grooves that guarantee your hands fit securely and firmly thereby completely eliminating any possibilities of an inadvertent slippage. That's beside the contoured and ergonomic design of the handle. Further, opening and closing the utility knife is quite effortless and quick so that even those with joint pains or arthritis can experience the eye-popping experience. It is built to be an all-around utility knife capable of tackling light-duty to heavy-duty projects that require aggressive cutting. It comes with contractor-grade utility blade that is guaranteed to make short and quick work of the toughest cutting and shearing projects around the house, the office, or on an outdoor expedition. Open, the utility knife is 5.1 inches long and has a weight of 2.5 ounces. It’s easy to control and maneuvre, as you would expect of a high-quality option. To the above features add a heavy-duty handle made from stainless steel. Besides the obvious rust and corrosion resistance, the handle is virtually unbreakable, making it an ideal choice for undertaking hard-use applications like cutting cardboards and plastics. Plus, the handle doubles as a pocket or money clip. While it doesn’t come with a quick-change mechanism, it’s compatible with either 2-1/4 inch contractor-grade or standard size utility blades. The icing on the cake is the generous limited lifetime warranty that covers you from deficiencies in material and craftsmanship. Compared to flimsy, humdrum models on the market, Gerber products have a reputation for endearing the test of time while outputting the best performance. And the Gerber EAB Lite is not an exception. Cutting thick and tough materials requires the use of a commensurately rugged and heavy-duty option. If that’s what you’re looking for then the OLFA Heavy-Duty knife is your best bet. Compared to flimsy, run-of-the-mill models that will break a sweat when cutting through abrasive materials, this option cuts easily and quickly, like a hot knife cutting through a piece of cake. That’s a cliché but in this case, it's never been more accurate. Tough materials such as foam insulation, cardboard, and even plastics can't resist the cutting prowess of this tool, a fact that explains its preference by tradespeople the world over. Aside from the conspicuous, easy-to-recognize yellow color, it packs several other signature features that make it a worthwhile consideration. The first in a long list of many is the durable and robust construction of the blade with first-rate carbon steel. The blade can withstand loads of wear and tear for several years and its cutting power will never dip even when it starts approaching the tail end of its useful life. To secure and stop the blade from dangerously wobbling about as you cut various tough materials, the utility knife conveniently features a robust stainless steel blade channel. For the resilience and strength that this product provides at its price range, it offers unmatched value and would be an ideal choice for value-conscious users. Unlike our previous pick, the ingenious design allows for the effortless and quick changing of blades. However, you won’t have to change blades frequently because of the aforementioned superior edge retention. The handle is also long-lasting and allows for a secure, comfortable grip so you can use it for several hours on end without the slightest symptom of hand strain or exhaustion. The locking wheel, on the other hand, ensures safe use during a project. As mentioned earlier, tough applications necessitate the use of tough knives and no option better fits that description like this one does. Boasting long-lasting sharpness and exceptional edge retention, it’s a solid choice for tradespeople and the DIY enthusiasts. We know what you’re thinking. How did this tiny piece of equipment make the list, right? Judging by physical appearance, the Slice 10514 can’t hold a candle to the industry giants we’ve reviewed so far. However, beyond the simplistic, run-of-the-mill looks lies incredible cutting power. The single slice ceramic blade is up to 20 times stronger, harder, and more durable than metal blades, a fact that puts the performance of this deceptively small utility knife at par with other industry giants. And it’s easy to use, as you’re about to find out. If you’re wondering what’s special about the slice ceramic blades that we can’t seem to stop yapping about, let’s put things into perspective for you. Compared to blades made from ordinary metal, slice ceramic blades can retain their edge up to 10 times longer. 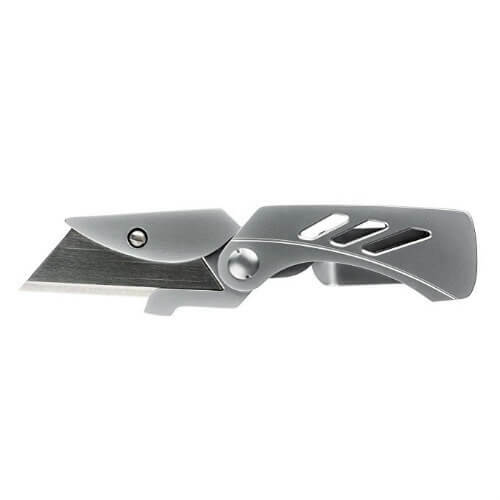 A single slice blade features the durability, ruggedness, and strength of some 20 metal blades put together. And this is not up breathlessly extolling the positive attributes in the hope that you’ll make a purchase. In essence, other options pale into insignificance when compared to the volcanic performance of this unit. The blades are similarly non-porous, non-stick, and impervious to various rust and corrosion agents, meaning that they provide nothing short of quick, accurate, effortless, and clean cutting results. With a long-lasting sharp edge, this tool can go without sharpening for several months on end. The lightweight, compact, and ergonomic design provides for self-guiding and controlled cuts, enabling you to cut cleanly and with less fatigue. 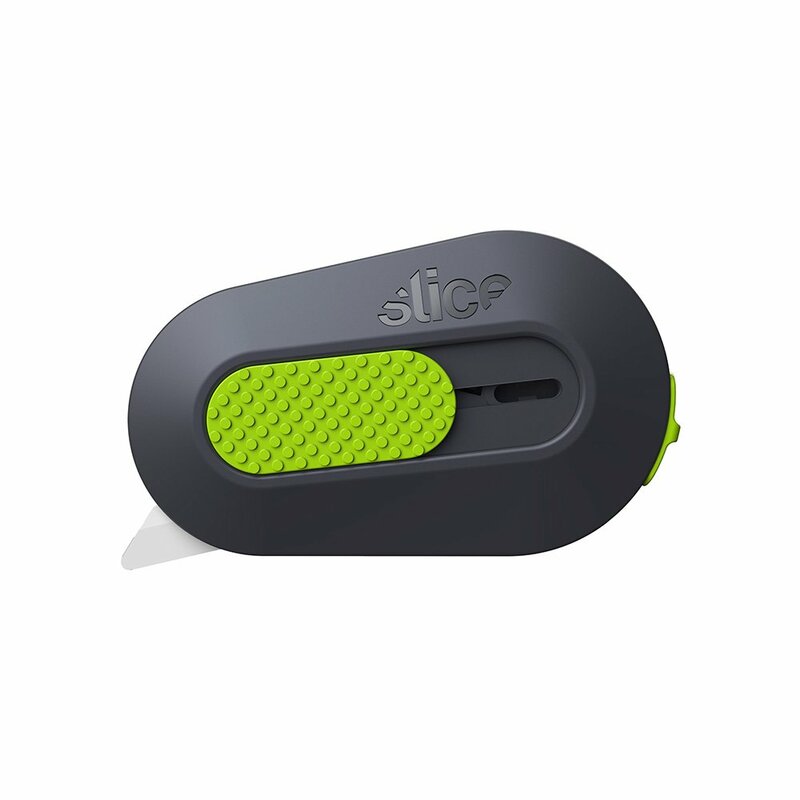 In light of its compact size, it fits snugly into most confined spaces such as backpacks and pockets and poses no danger of cutting you as it conveniently features an auto-retractable blade. Like other high-end models, changing the blades is both tool-less and quick and there's a lanyard hole for the user's convenience. 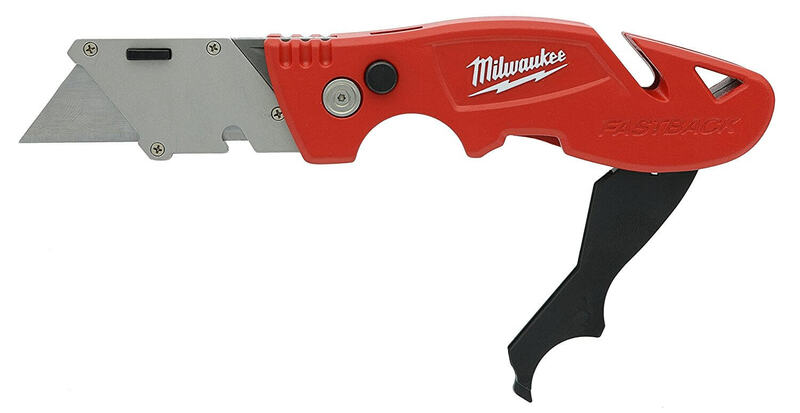 A careful assortment of performance and convenience features deservedly earn Milwaukee 48-22-1903 a spot on our list of 10 of the best options currently on the market. Unlike the vast majority of utility knives out there, this item is safe, easy to use, comfortable and secure – a combination of attributes you don't come across every day in cost-effective products. 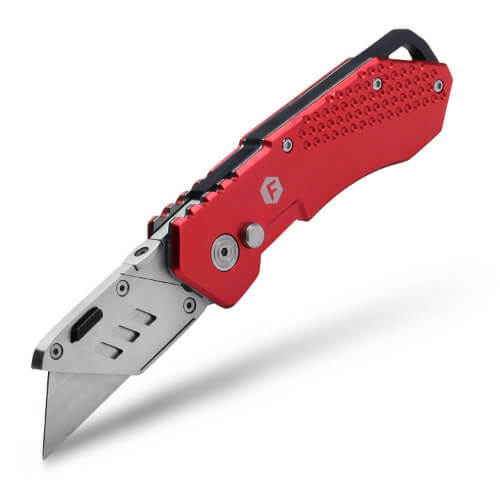 It has an onboard storage for 4 extra blades, opens and closes with remarkable ease and since it locks at a convenient 45-degree angle, it takes the hard work, time, and frustration away from cutting a wide range of materials around the house, in the office, and outdoor environments too. If you’re anything like us, you won’t be able to put it down the first time you try it out, and of course, you'll have to try hard to fight the temptation to cut things you shouldn't. Because of the practicality of its design, coupled with the razor-sharp blade and comfortable handle, the unit cuts like nobody's business. Expectedly, the blade is made with a high-quality material and is, therefore, able to withstand attrition for months on end. It'll take some serious beating before it starts to give. The spectacular edge retention and sharpness of the blade allow you to confidently cut through a wide array of materials including but not limited to boxes, twines, cardboards, bamboos, wires, and ropes. The handle grip is comfortable and easy to hold, thanks to its ergonomic design and conformity to the natural contours of the hand. The included wire stripper can handle up to 12 gauge size and the gut hook enables you to quickly cut finer objects such as strings without opening the blade. Blade replacement is, of course, quick, effort, and tool-less. Additional features are the convenient lanyard hole and wire clip for hands-free portability. If you’re a sucker for effortless, smooth, and reliable cutting performance, we can’t recommend it enough to you. Its performance will leave you in awe. For the value-conscious homeowners, outdoor lovers, and tradesmen reading this, we have just the right product for you. 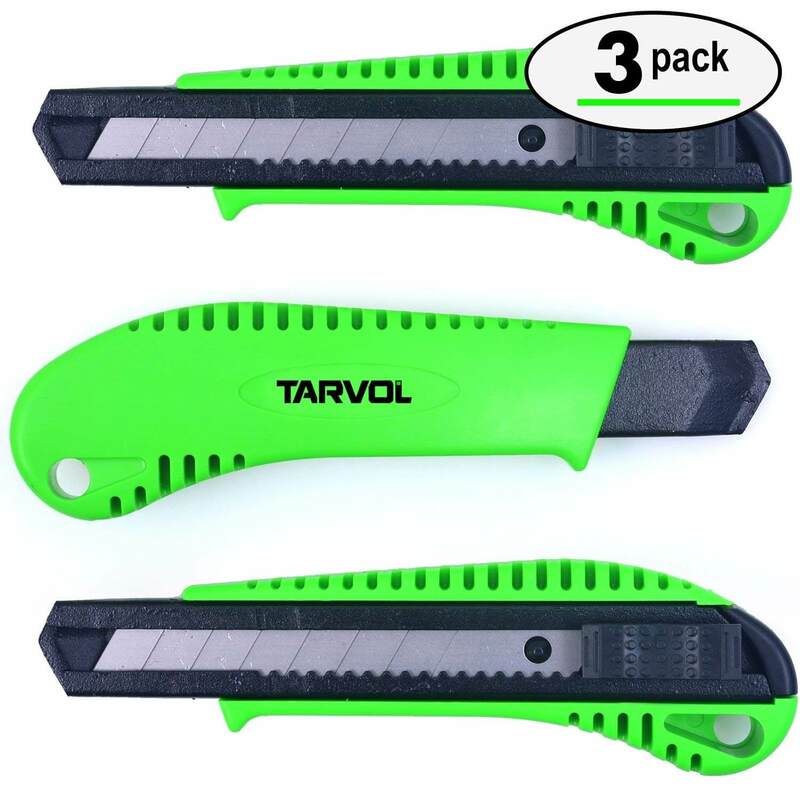 Box Cutter Utility Knife is a premium grade utility knife that comes in a pack of 3 for the price of one. The pack is also quite affordable, which is not to say that it's poor quality. As a matter of fact, it has several instrumental features starting from the retractable snap-off blades, comfortable ergonomic handle, versatility, durability, and incredible cutting power. The item is one of the most versatile tools we've encountered so far. The blades are tough, hard, resilient, and because of the admirable edge retention, it maintains its edge for months on end. You can confidently use it to cut moving boxes, drywall, roofing, leather, cardboard, rubber, and several more. In none of these instances will the user experience a performance glitch or struggle with the blade. The performance of the unit is always reliable, and it cuts smoothly, flawlessly, and quickly. Like the blades, the handle is made from high-quality, high-impact ABS material for longevity. The ergonomic design and the soft rubberized grip means you can use them for hours on end without suffering hand fatigue or strain. The lightweight and compact design, on the other hand, provides for remarkable maneuvrability and control. You'll require little effort to open and close the blade. It’s not all hunky-dory though. The only downside to the construction of the utility knife is the ease with which the blades dull after undertaking hard-use applications. It’s optimized for only light- to medium-duty cutting tasks around the house. Aside from this minor disadvantage, the tool works like a charm. This option knife comes with all the hallmark features of a high-end utility knife and its performance, for lack of a better word, is heart-stopping. Predictably, it cuts easily and efficiently. Like our 2nd choice, it comes with a lock-back mechanism that encourages confident and safe use and is remarkably rugged and long-lasting, thanks to the robust and sturdy construction with high-end materials. The package comes with 10 extra blades in addition to the installed one and considering that it has a time- and effort-saving quick-change mechanism, rust and dullness will now be the least of your concerns. It comes prepared for any cutting project you may throw in its path. With a total of 11 high-quality blades, one installed and the other 10 safely kept in the dispenser, the machine doesn’t shy away from the toughest cutting and shearing projects. Whether it’s framing a new house, installing an electrical hardware in the house, or exploring the great outdoors, the versatility, practicality and functionality of this model will always come in handy. With the machine firmly an safely in the palm of your hand, rust and dullness are trivial concerns. All the 11 blades are constructed from high-grade materials. As for convenience, the utility knife cuts smoothly, accurately, and quickly because of the impressive edge retention of the blade and the fact that the all-aviation-grade aluminium handle allows for effortless maneuvrability, even in tight or awkward spots. Replacing the blades is just as effortless, thanks to the quick-change mechanism while the lock-back design ensures the safety of your hands and arms as you tackle tough and demanding projects around the house, at the workplace, or in the wild. Before we forget, the tool also has a heavy-duty stainless steel belt clip, just like other high-end models on the market. The highly recommended item offers tradesmen, outdoor enthusiasts, and extreme DIYers a litany of auxiliary features for quick and efficient cutting. And since it’s cost-effective, we don’t think you can turn up your nose at it. Home Planet Gear may not be a household name but their flagship item, the Home Planet Gear Utility Knife, operates on the same keel as the other options on this list. Some of the features that make it stand out and worthy of consideration include its all-around versatility, the retractable multi-position blade, lock-back mechanism, anti-slip handle with a blade storage compartment, and a user-friendly design. If these features don’t sway your purchasing decision, maybe the fact that the tool is competitively priced will do the trick. The first signature feature is the fully retractable and lockable multiple position blade. The innovative design allows for extending and locking the blade at the following positions: 1/8, 1/2, 3/4, and 1 inch. Locked, the blade is safer and easier to use, providing more accurate and efficient cutting results. The user-friendly design also gives you superior control for more accurate cutting while sparing your knuckles unnecessary discomfort. With a quick-release system, changing blades is easier and quicker, compared to cheap, off-brand models. You won’t have to use any specially designed tools. The handle is forged from first-rate zinc-alloy for durability and because it’s ergonomically shaped and rubberized, it’s a cinch to use for extended periods. For hassle-free portability, the utility knife is not only lightweight but also compact, fitting easily and snugly into most back pockets where it’ll be quick and easy to reach when the situation calls for it. Another unique feature is the blade storage compartment in the handle that can accommodate up to 5 sharp blades. The blades stay sharp for much longer than most options and will enable you to cut quickly and effortlessly. Whether it’s the cardboards, carpet, drywall, rope, vinyl, limbs and branches, or package you intend to rip open, the tool can do it all. 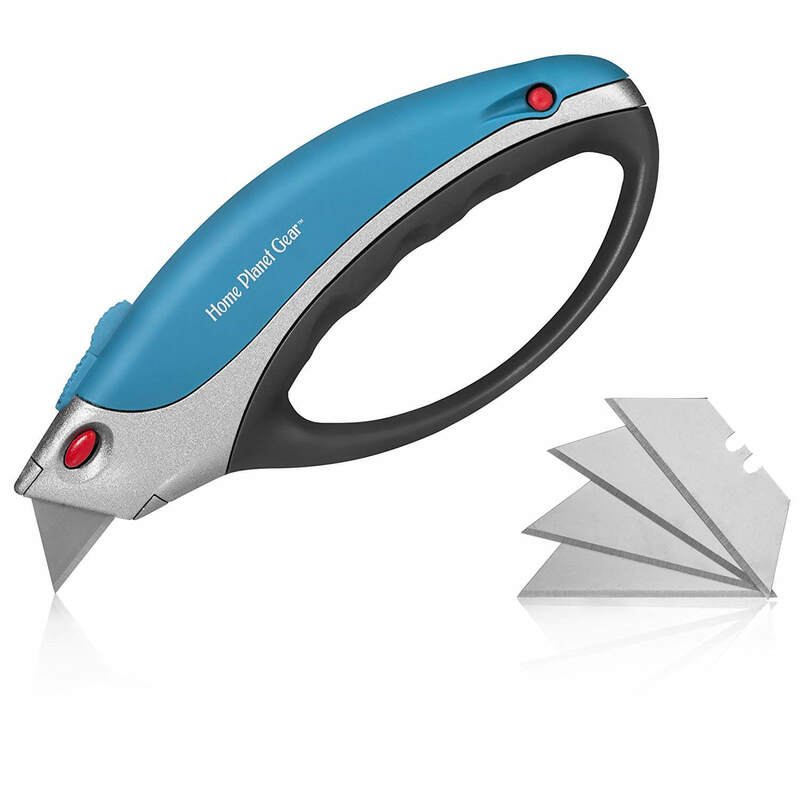 If you’re tired of using the kitchen knife for ripping open Amazon packages or cutting various materials around the house and want something built for the tasks, consider going with the Home Planet Gear Utility Knife. It’ll always get the job done. DeWalt is clearly a brand that doesn't need an introduction. 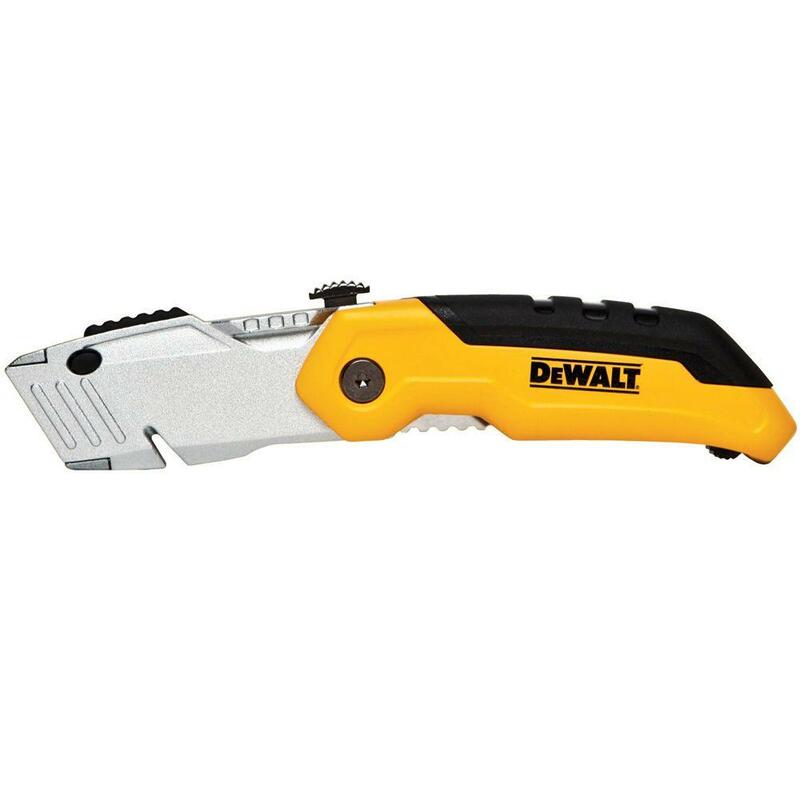 Its power and hand tools are synonymous with quality, durability, high-performance, and ease of use and their leading utility knife, the DeWalt DWHT10035L, easily continues that tradition. This model overshadows its competitors in every aspect, right from performance, ease of use, to affordability. It offers great value for the buck and with an ability to withstand loads of wear and tear, it can easily last more than a lifetime without the need to replace any of its parts or components. And that’s why we love it. 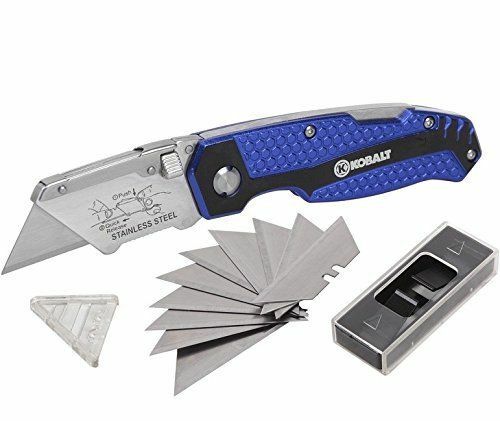 The tool has a solid and commanding presence in the hand and is a far cry from the flimsy models masquerading as utility knives all over the market. It's a durable and sturdily built tool perfect for taking on the toughest and most demanding cutting projects around the house, in the office, and out in the wild. The blade boasts outstanding edge retention which, coupled with its sharpness, makes short and quick work of various tough and thick materials. The tool's unique selling point is the ability of the blade to both retract and fold, giving superior control over the depth of the cut you want to make. Abrasive materials won't faze this tool, that's for sure. Opening and closing the blade is effortless and can be quickly accomplished with a single hand. When the blade dulls, and you have to replace it with a new one, you don’t have to unscrew any bolts. Neither will you require any special tools as the utility knife comes with a tool-less quick-blade change mechanism. Like the blade, the body is rugged and strong but doesn’t comfort or usability. It’s non-slip and conforms to the natural contours of the hands, giving you a secure, firm fit. For use around the house, the DeWalt is definitely an overkill. However, if you handle tough materials such as foam insulation, cardboard, corrugated boxes, and the like, it's a perfect choice. Its reliability is admirable. The vast majority of utility knives come with either a folding or retractable blade while a few, like DeWalt DWHT10035L – discussed in great detail – comes with both. All three have their fair share of upsides and downsides. Folding blades are safer, more portable, easy to store, and feature useful belt hooks, and pose minimal risk of inadvertently deploying. They’re however not ideal for hard-use tasks. Retractable blades, on the other hand, are optimized for heavy-duty applications because of their sturdiness. Nevertheless, they lack the portability and lightweight design of folding blades. The quality of a tool’s handle grip is an important concern if you expect to make repetitive cuts or come into frequent contact with moist materials. Utility knives are often razor-sharp meaning that they can easily ruin your cutting piece within seconds of losing focus. In the work case scenario, they can sever your finger. With that in mind, make sure the handle of your knife is textured, curved, or comes with a finger ridge or better yet, features a finger groove for preventing the hand from slipping to the blade as you work. Needless to say, the handle grip needs to be comfortable to prevent hand fatigue and strain for prolonged use. Cutting tough and thick materials like cardboard, trimming a rug pad, bamboos, branches, and foam insulation requires the use of a high-quality, heavy-duty capable of withstanding extreme use. It should be able to retain its edge for long and require minimal maintenance in the way of sharpening. The same goes for the handle. Aside from being indestructible, the handle needs to last long and not skimp on sturdiness. All the buttons should also hold up to heavy-use and provide for effortless and quick deployment of the blade when the situation calls for it. To cap it all off, your tool should be resistant to rust and corrosion. They don’t have a significant bearing on the performance but additional features can help take most of the hard work and time from cutting tasks. One such feature is the wire stripper for quick and effortless stripping. Another feature is the lock-back mechanism for securing the blade. Another is the quick-change system that provides for effortless changing of blades. If the handle comes with a dedicated spot for storing extra blades, that would be nice, right? Q: Are knives legal to carry around? A: It’s prudent to be conversant with the local state laws before purchasing as some of them have restrictive laws. Confirm before committing your money. Q: Which precautions do I need to keep in mind when using one? A: There are several. Aside from the obvious keeping your body away from the line of the cut, wear appropriate gloves, never use dull knives, and always focus whenever you’re cutting anything. A utility knife is indeed a staple for any DIY project, allowing you to quickly, accurately, effortlessly, and efficiently cut different materials. All the 10 models featuring on our list are the crème-de-la-crème of the industry, easily exceeding performance, versatility, convenience, and durability expectations despite their budget-friendly prices. They’re a hard deal to beat. Provided you go for a model that best suits your cutting tasks, you’re in for a treat.